I'm finally making a little progress on both the knitting and reading fronts. 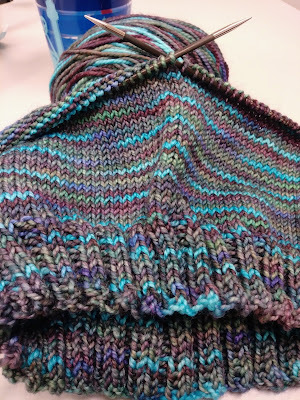 I started hat #17 and am only a few rows away from bind off. It's a simple stockinette hat, knit with Hawthorne Vancouver from Knit Picks. I just love this colorway. It's a blend of all my favorite colors - turquoise, hints of grapey purple, reddish/brownish burgundy and golden greens. And I'm going to have enough left over to knit matching fingerless gloves. Yay!! As for my reading, I broke my book monogamy rule. I'm currently reading four books, which is unheard of for me. 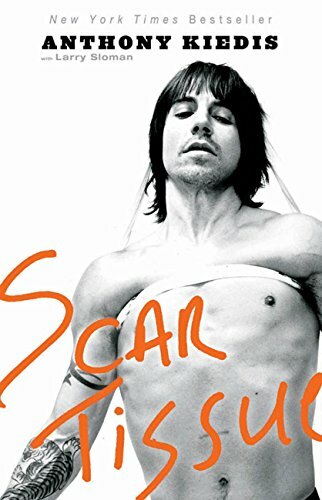 First, I'm only a chapter or two away from finishing Weird Hikes, I'm about half way through Circle of Blood, I'm trying to spend 30 minutes a day (but failing miserably) reading Never Eat Alone, and just yesterday, I picked up Scar Tissue. I've enjoyed Weird Hikes and Circle of Blood is okay. My Kindle recommended it because I liked the Black Dagger Brotherhood series. Several of the Black Dagger books I devoured in one sitting. Circle of Blood isn't holding my attention nearly as well, but it's still an okay story so far. It's just moving at a lot slower pace and my expectations may have been slightly too high. Never Eat Alone is encouraging me to leave my introverted bubble occasionally, so that's good. And then there's Scar Tissue. I'm excited to have stumbled across this book. It's a biography of Anthony Kiedis from the Red Hot Chili Peppers. I've been a Chili Pepper fan since the '80's so it's pretty much a given that I'll enjoy reading about Kiedis's life. And best of all, my new eye glasses finally arrived so I can actually see to read! Yay!! The books you're reading all sound interesting. I wish it was a light issue for me. I'm basically blind without the glasses. love the colorway of your hat and simple is wonderful isn't it? lots of tv or reading time to go with the knitting! Yes! Being able to read & knit at the same time saved my sanity yesterday. They're clearing a lot down the street from us & managed to knock out both our electricity and our internet for quite a while. Thank goodness for a book & some yarn! The hat and yarn are lovely. I can see why you love that colorway. Wow, 17 hats! That is quite the knitting accomplishment. And I join everyone else with my appreciation of that colorway. I've promised myself not to buy any yarn until summer, but it's possible I might cave (especially since you helpfully provided a link)! Do love your yarn...and the fact that you're going to get fingerless gloves, too! I got new glasses in Dec...they do help, considerably! Wear yours in great health! Hooray for new specs! It's always NICE to be able to SEE what you are doing. Yes it is! My old glasses were so old I was almost better off without them. It's so nice to be able to read normally instead of like a kindergartner, struggling with each letter in each word.